I love looking at the creative Bible journaling that some women can do. Beautiful drawings around different passages of scripture illustrate what they have learned as they read these verses. They look lovely. I have done spiritual journals over forty years. I have two boxes full of notebooks of every shape, size, and color filled with my scribbling of what I learned from the Bible on a given day. They aren’t beautiful to look at. There are crossed out words, words written between lines, writing up the side of the page. Margins are ignored. There are a few charts and graphs that helped me think through things, and on some pages I draw my standard daisy while I think or listen. But it’s nothing someone would leaf through admiringly. I’m not even sure it’s something someone would want to read or even peruse. Sometimes one can find a story of how God is working or my ranting about some frustration or worry in life. In fact, I tried to read through them last year to save what was worth saving and toss the rest so that my children wouldn’t be burdened with that some day. However, I lost interest and the boxes sit in a closet instead of the attic now. In spite of that, I strongly believe in the spiritual discipline of journaling what one is learning from God through His Word, prayer, and life. I love it that Nehemiah seemed to do this. The inspired part of his journal (I can’t help but think this wasn’t the only journal he kept) begins as though he expects someone to read it and be curious about the author. Later he explains his work with the king in Susa, Babylon. But other than that, it appears to be the reminiscences of someone who want to have a record of how God has worked in and through him. So I was talking to my brother the other day and some of the other men who had come from Judah, and I asked them how things were going for the Jews who went back and are living there now. It’s such a simple question. It may have been a way of making conversation, but it changed the course of his life and he wrote it down. The people in Judah were not doing well and were basically living in dangerous squalor. Then Nehemiah records how upset this made him. He wept. He fasted. He prayed. I also love the way he inserts his prayers into the narrative. When I write so often it becomes a prayer, I usually don’t realize when I quit writing to figure things out and when I started talking to God about it. After Nehemiah pleads with God about the situation, he goes back to work, but the king realizes something isn’t right with Nehemiah and he asks him about it. Nehemiah was afraid, because you don’t act upset in front of the king. But he’s brave enough to tell the king what is bothering him. In direct answer to his prayer, the king says, “So what would you like me to do?” Nehemiah records that the first thing he did was shoot up an arrow prayer. 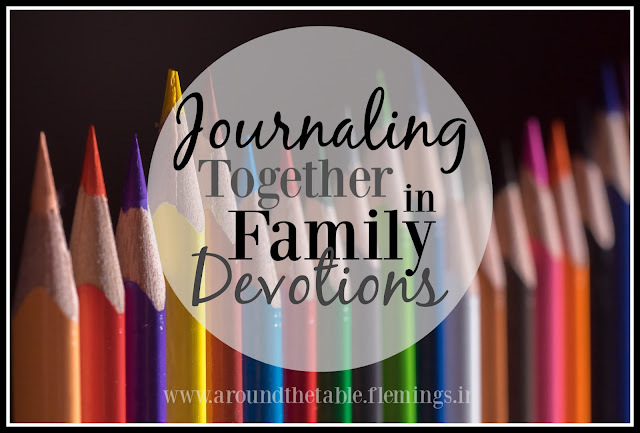 Later in the journal he breaks out into prayer, “Remember me, Oh God...” as he writes about what he has learned, how God has given him the encouragement to carry on, and the good and the difficult results. Keeping a spiritual journal is a way of remembering how God has worked and how you have grown in your spiritual life. Our children can do this, too. After dinner clear the dishes off and present them each with a notebook you think they will like (or take them shopping and let them pick one out.) After your family devotions have them write (or draw) as many of the items below as is age appropriate to begin learning this spiritual discipline. Write about or draw something that happened today that is on your mind. Write or draw something that affected or touched you from the Bible reading/story. What is one thing you would like to learn more about from the story? What from the story/passage reminds you of your own life? Write down one thing you learned you should do, not do, change, start, or fix as a result of the Bible story/passage. Tell God about what you thought about as a result of the lesson. This can be a good way to start your own spiritual journal. Answer some simple questions about life and God’s Word and talk to Him about it. We have scripture study everyday. Each one of us keeps a journal but we share out thoughts and opinions around the table. Found you on Grandma's Briefs link party. What a great idea! So glad you do that!